There is much talk about teaching our kids to self-regulate, use impulse control and learn to react calmly to adversity. This is all well and good but merely talking about it and wanting it to happen certainly doesn't ensure that our children will move through adverse situations with ease because we merely want them to. We can tell them to calm down and take deep breathes, use their words and make good choices, but again, will they magically internalize this way to "be" just because we have told them that's what is best? When we don't react with yelling, anger, threats, bribes, and consequences which certainly are no model of self-regulation, we often times engage in the "talking to" the secret word for "lecturing". We explain things ad nauseam with the expectation that our children will look at us with utter adoration and agree with how much sense we are making, thereby altering their behavior to be more acceptable. When has that ever happened? Do they appease us by agreeing and nodding because they are dying for the lecture to stop and counting the moments when they can move on and away from the shame? I guess it's a step better or perhaps just different than our own parents who would often tell us what to do "no ifs, ands, or buts about it". What doesn't happen after a lecture is really anything productive. I have heard parents say, "We had a long discussion about "x" and now I think he really understands". This is probably not the case. What has happened is you have spoken at great length about how you think things "should" be. You have explained every facet of the occurrence and told them just how wrong they are, leaving no place for them to save face. Moreover, this type of interaction erodes your connection, and your child feels judged and scolded even though there has been no punishment or consequence. It has still been made plainly obvious that they are wrong and you are right. We know from experience how that feels. So now how do you teach your children to self-regulate? I love to use the quote from a group of researchers on learning. It has been said that 80% of what children learn is what is modeled to them. I know this to be true because I became 80% just like my parents without having them tell me a thing. Merely by watching I learned to yell, scold and belittle. I wasn't instructed to be this kind of parent, nor did I study this type of behavior as my guide to parenting. I'll tell you what though, it was modeled to me and that modeling became instinctual almost second nature, my default. 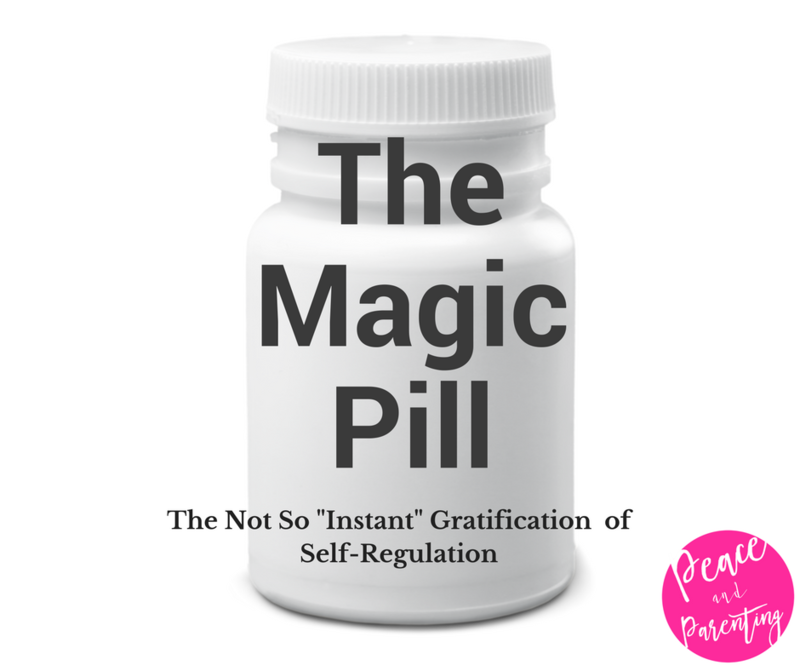 We teach self-regulation by regulating ourselves. In adverse times when things get crazy in our world, we show our kids how to be calm and relaxed. When Pia tries to kick me, Esme says she hates me, the water boils over on the stove, I trip over the cat and dinner is an hour late, I remain calm. I come with love and kindness, and I take really deep breathes and talk to myself with mantras of serenity. I remind myself that these things are normal and my child is not "bad" or "wrong" but rather having a hard time which has nothing to do with me. Dinner can be late and water is easily cleaned. Over time, lots of time...perhaps their entire childhood, they will learn self-regulation. Will it happen the first time you chose not to lose your temper? No, but it will happen over time, slowly but surely.